When Laura Palmaro was 10 years old, she woke one morning to find that the central vision in her left eye had all but disappeared. She was not ill and had no genetic issues—it was completely out of the blue. When she was 14, the same rare condition struck her right eye, and she began her freshman year of high school legally blind. Suddenly she was forced to depend on other people to read everything aloud, from school assignments to menus. The toughest part, according to Laura, was losing her sense of independence—and not knowing when or how she would get it back. We agree with Laura about the power of technology to change lives. And in order to support more people like her—people who see obstacles as opportunities—we’re launching the Google Impact Challenge: Disabilities. We’re putting $20 million in Google.org grants behind nonprofits using emerging technologies to increase independence for people living with disabilities, and today we’re issuing an open call to identify new areas of opportunity at g.co/ImpactChallengeDisability. We’re kicking things off with support for two remarkable organizations. Each of these organizations is using technology to dramatically reduce the cost of and access to prosthetic limbs and auditory therapy, respectively—which could be transformative for hundreds of millions of people. The Enable community connects people who want prosthetics with volunteers who use 3D printers to design, print, assemble, and fit them, for free. This dramatically cuts costs, increases speed of distribution, and meets unmet needs. We’ll support the Enable Community Foundation's efforts with a $600,000 grant to advance the design, distribution and delivery of open-source 3D-printed upper-limb prosthetics. Diagnosing auditory challenges can be a struggle in low income communities—the equipment is expensive, bulky and unrealistic, particularly in the developing world. With our support, and a $500,000 grant, World Wide Hearing will develop, prototype and test an extremely low cost tool kit for hearing loss using smartphone technology that’s widely available—and affordable—in the developing world. The Google Impact Challenge: Disabilities will seek out nonprofits and help them find new solutions to some serious “what ifs” for the disabled community. We will choose the best of these ideas and help them to scale by investing in their vision, by rallying our people and by mobilizing our resources in support of their missions. But of course, we realize there’s always room to improve our products as well. We have a team committed to monitoring the accessibility of Google tools; and we provide engineering teams with training to incorporate accessibility principles into products and services. That doesn’t just mean improving existing Google tools, it means developing new ones as well. For example, Liftware is a stabilizing utensil designed to help people with hand tremors eat more easily, and self-driving cars could one day transform mobility for everyone. Historically, people living with disabilities have relied on technologies that were often bulky, expensive, and limited to assisting with one or two specific tasks. But that’s beginning to change. Thanks to groups like Enable and World Wide Hearing, and with tools like Liftware, we’re starting to see the potential for technologies that can profoundly and affordably impact millions. 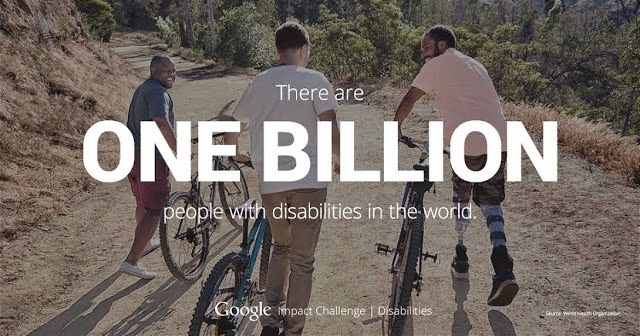 But we’ll all get there sooner if we make it a team effort—which is why we’re launching Google Impact Challenge: Disabilities today. Together, we can create a better world, faster.